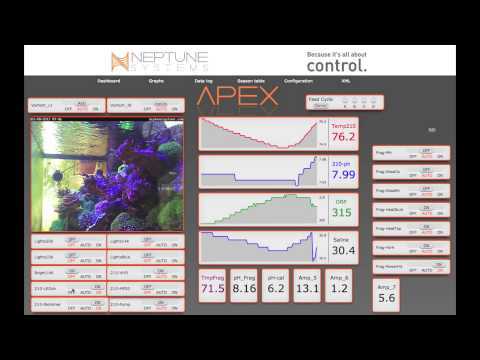 The Apex runs at up to 10x the speed of other controllers in its class due to its advance processor technology (most others use 8 or 16 bit microcontrollers). It also has enough memory on board to store many month’s worth of complete tank data in non-volatile RAM. Even with a power outage, your tank history and all configurations are safe. External 12V Power Capability – UPS Ready! The Apex Base Unit comes with an external 12V power input. With an optionally available wall transformer and a second Energy Bar, this enables you to configure your Apex for power-outage mode. You just plug the 12V transformer into your Apex and then into a UPS (uninterruptible power supply) along with your extra Energy Bar. You then plug a powerhead and an air pump with stone into this Energy Bar. If the power should ever go down, your Apex will sense the problem, and will activate the powerhead and air stone potentially saving the day for your fish and corals! The Energy Bars continually send their information on their present current drain to the Apex controller. This is incredibly useful information for a number of reasons. First, it enables you to recognize what the overall power consumption is on any Energy Bar so that you can better distribute the load across your multiple Energy Bars. Also by having this feature you can accurately determine the power utilization of your tank to compare different lights, pumps, skimmers, etc. While some may tout the importance of a color display, we disagree. We believe the most important thing for our customers is ease in readability and size of the display. What good is a color display if it is barely larger than a postage stamp. That is why we went with the backlit graphical display we did. It was the perfect match of function and value for our customers. The Apex System can be fitted with two pH probes or one pH Probe and one ORP (Redox) probe. Go to our probes page to read more about what probes are available to add to your Apex Lite System.